Chamber President Marilyn Hardacre indicated the lease had been signed on the Chamber's new office and also introduced the Chamber's new secretary: Verlinda Norris. The speaker for the program was Gary Evans, Oklahoma Department of Transportation (ODOT) Division 8 Engineer. Mr. Evans stated that Oklahoma has a $7.6 billion backlog of bridge repairs that should be made to 1,116 of the 6,728 total bridges. 135 bridges are over 80 years old. One Oklahoma bridge still in operation, was build in 1896. Evans blamed a shortage of funding for not even being able to keep the metal on bridges painted to prevent further erosion. Although the overall ODOT budget has not varied much from the $200 million annually they have used since the 1980s, the percentage used for bridges has increased recently. In 2002 Oklahoma had 636 fatal vehicle collisions resulting in 735 deaths. 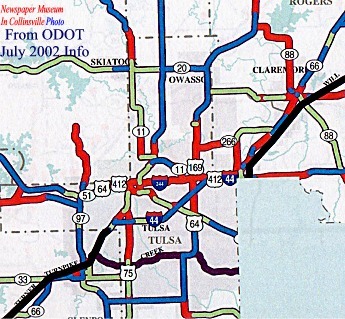 Mr. Evans indicated more than half of those occured on the worst 25% of Oklahoma's roadways. 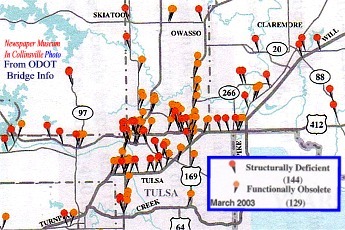 A sample of the local "structurally deficient or functionally obsolete" bridges according to ODOT. Gary Evans indicated these bridges are safe to drive on at present ... but with a lack of funds for repairs and preventative maintenance they will continue to get worse. I-40 bridge which cost $15 million. Another $15 million was spent on the detour route while the bridge was out. About half of those funds have been recovered from Federal Emergency sources and more is still pending from legal action against the barge company that caused the accident . Fourteen people died in that May 26, 2002 bridge accident. 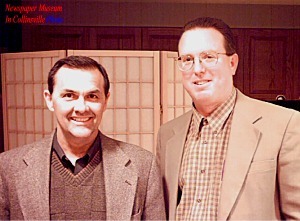 State Senator Randy Brogdon and ODOT Engineer Gary Evans pose following the Collinsville Chamber of Commerce meeting Nov. 6th. This local portion of the ODOT Division Eight 2003 Highway Need Study map shows the "years to next surface replacement". Those in red need surface replacement now. Those in green should be repaired in the next 5 years. Those in blue have had recent resurfacing. $1400 was raised from basket sales which will be used to purchase 24 Christmas banners for Main Street. After Christmas, new "Discover Collinsville" banners will begin appearing on Main Street. The 30x60 inch red and blue banners are sponsored by local merchants for $100 each. The Christmas Parade will be Dec. 13th and begin in the park. Contact the Chamber to have your window decorated by C.H.S. art students.